Soon it will be flying around the Moon. With this latest test, NASA continues to set the stage for deep-space exploration missions, achieving another milestone toward launch of the first integrated flight of SLS and the Orion spacecraft, known as Exploration Mission-1…SLS will be powered at launch by four RS-25 engines, firing simultaneously to provide 2 million pounds [900,000 kilograms] of thrust and working in conjunction with a pair of solid rocket boosters to produce up to 8 million [3.6 million kg] pounds of thrust. Exploration Mission-1 (EM-1) will make use of four Aerojet Rocketdyne RS-25 engines, all of which are former space shuttle engines, although the flight controllers used to operate them will be new. It’s the controller that acts as the “brain” of the system, coordinating internal health diagnostics, precision control of engine operations, and communications between the SLS and the RS-25 engine. 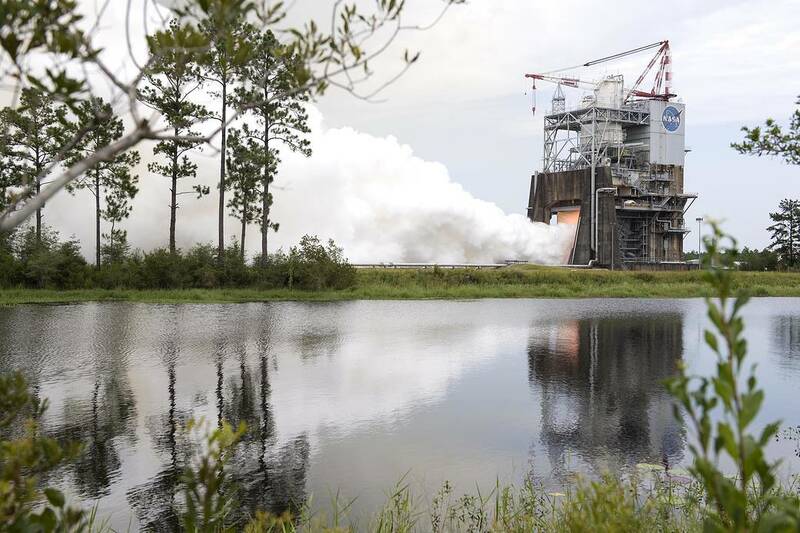 The controller keeps in touch with the SLS flight computers throughout the launch and flight, receiving commands and providing data on status and engine health.The first successful test of the new RS-25 engine flight controller took place in March, and the second test happened in May. NASA is planning a 2019 launch for the EM-1. The crew-less Orion space capsule will take its three-week trip around the Moon after it is launched by an SLS rocket.